Here are 5 reasons why the Gamia Zink Exterior spiral staircase is the best choice kit for the UK. Its not like we ever get any rain in the UK, but still its great to know that if it ever did rain, the staircase would not go rusty! Unlike paint finishes the zink coating on the Gamia is maintenance free, you just leave it to gently weather to a grey patinated finish. Now it might seem a bit odd to say this as you would imagine this would be the case on all spiral staircases, but actually most kit stairs can’t achieve the same height treads all the way up the staircase. Models such as the Civik Zink will only work if you use two different tread riser heights in the same flight, for example, due to the limitations of their tread adjustment. 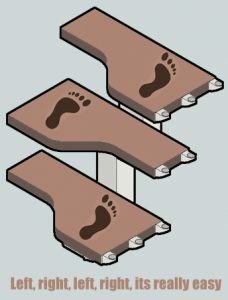 There will also be occasions with the Civik where you can only reach your chosen height by making the treads really high, much higher than building regs allows. No such problems with the Gamia Zink, its got continuously variable adjustment on each tread allowing height to be set to fractions of a millimetre! Which is the smallest in the UK! So you can save space AND meet the regs in one compact package. There are no other small exterior spiral staircase kits that can achieve building regs. If any of our competitors say their spiral stairs can do it, get it in writing! To which you are entitled to think “Big Deal” – but the new smooth, modern version of the handrail is proving to be very popular. To be honest the old handrail was never very popular, as it was a hangover from the eighties. Like big shoulder pads and the Nissan Cherry, its had its day. Time for a change. Arrivederci, adios, farewell, bogoff, the ugly handrail is now gone! And of course the new handrail is one-piece pvc, which is really easy to fit. NO kinks or joins in it, and really modern looking, it will really set off your spiral staircase a treat! It is fantastic value for money! 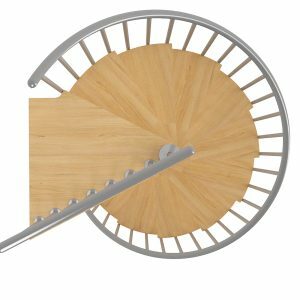 I would venture to say that with everything the Gamia Zink spiral staircase kit offers, you won’t find a better spiral for the money. You can save money by building it yourself, its easy to assemble, its rust proof, it meets the building regulations, it arrives in 2 weeks from order, its compact in size, its adjustable for height to get a perfect fit, etc etc. Whats not to like? Exciting new colours have been announced for the Artemis spiral staircase range, available from July 2018. 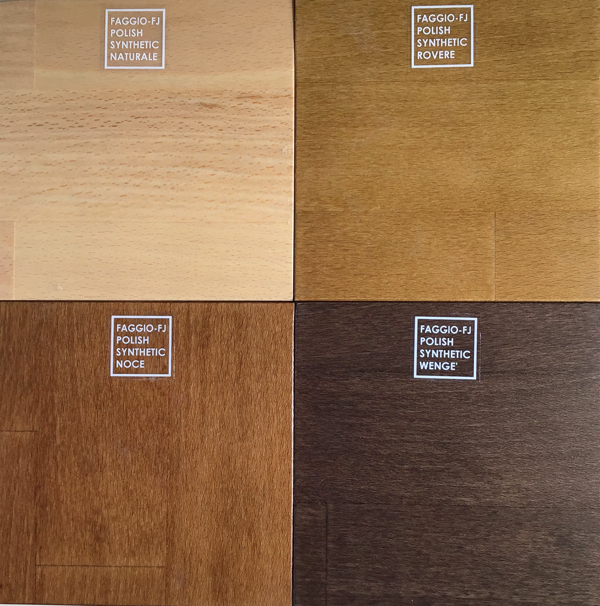 The original 4 wood colours, Natural Beech, Light Oak, Walnut and Wenge have been revamped to give a lighter feel and more natural finish, closer to the real wood colours. The standard colours are available on a fast 3 to 4 week turnaround. The two most popular finishes – natural beech and oak stain, are unchanged from before which is great news! The Walnut (Noce) and Wenge stains are lighter and more vibrant than their previous versions. All wood components are beautifully hand-finished as before, with the same attention to detail and quality the Artemis is renowned for. In addition a range of Custom Colours has been added, which extends the range and choice available. The new colour options give you more choice of finishes than any other kit on the UK market, and more choice is a good thing! Custom colours will take a bit longer than the standard colours, so you need to allow approximately 6 weeks for delivery. Prices are an additional 25% on the standard colour range. The Artemis spiral staircase range is our premium product, designed and manufactured in Italy to our very high standards. It is ideal for high traffic areas in both domestic and commercial situations, due to its superior design and load-bearing capability. 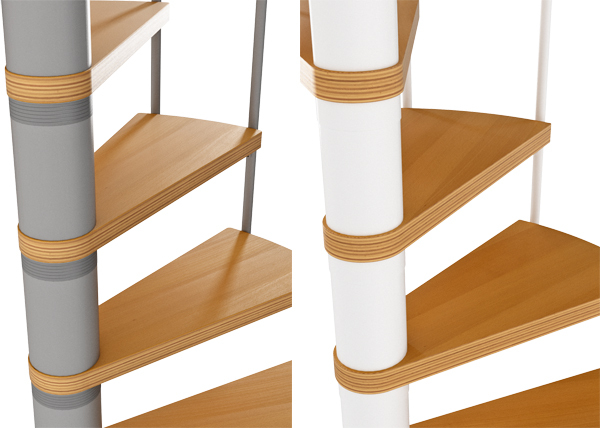 A new version of the Gamia Wood spiral staircase kit is now available. 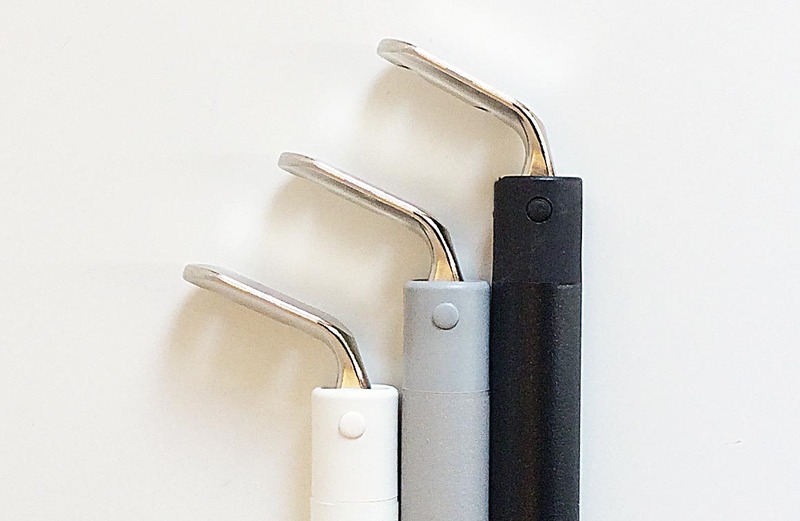 The new version features a colour coded handrail and fixings, so if you order a grey staircase the fixings and handrail will now be supplied in grey instead of the old black colour. The handrail is now a smooth pvc moulding, which looks more modern and attractive than the Moplen handrail it replaces. The black version of the staircase will still have black fixings and handrail, but the handrail will be the new smooth profile. This upgrade is expected to make the Gamia Wood even more popular, especially as it meets the requirements of building regulations in the UK. 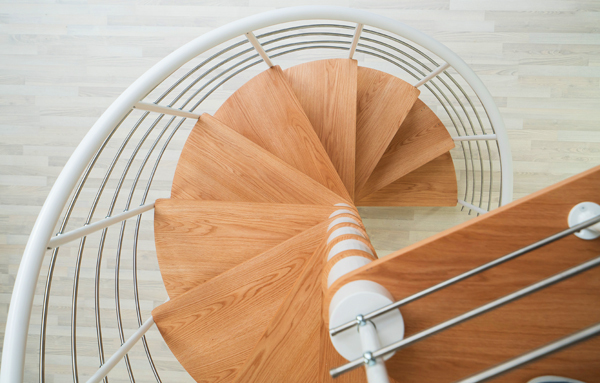 Very few competitors have a 1400mm diameter spiral staircase which meets these regulations, so we expect the Gamia Wood to maintain and increase its popularity during 2018. The 1400mm diameter and 1600mm diameter versions meet the requirements of British Standards for secondary use, under BS5395-2 as required in building regulations. The Italian manufacturer has maintained the high quality components, such as solid beech treads, which you don’t get on other spiral staircases in this price range. The new one-piece handrail is easy to fit, even for a novice, as it is flexible yet extremely solid when installed. As with the previous model, the balustrade system is designed for the UK market, with the correct UK spacings for spindles and the correct height too, so you can be assured your balustrade system will be safe and secure. If you have young children, there are also Child-safety riser bars available to close off the open treads, and to prevent the passage of a 100mm sphere as required in building regulations. Here are 5 great things about the Dolle Calgary Spiral Staircase, in no particular order! In this article we look at choosing a space saver staircase kit, and how they can fit into such small spaces. The secret is in the paddle-shaped treads, combined with a narrow flight that you can squeeze into the tightest of spaces. Typical dimensions for a Space Saver Staircase, in this case the Gamia Mini. Space saver stairs were originally designed to allow access to loft conversions. In a lot of properties in the UK space is at a premium, and fitting a full sized staircase to a loft room could mean losing the use of an entire bedroom. That’s not a very desirable outcome when you want to add a room! Space saving stairs were incorporated into building regulations to allow safe, fixed access to a loft but with a very small impact on the space it uses. So how is this achieved? The secret is the Paddle Shaped Treads! 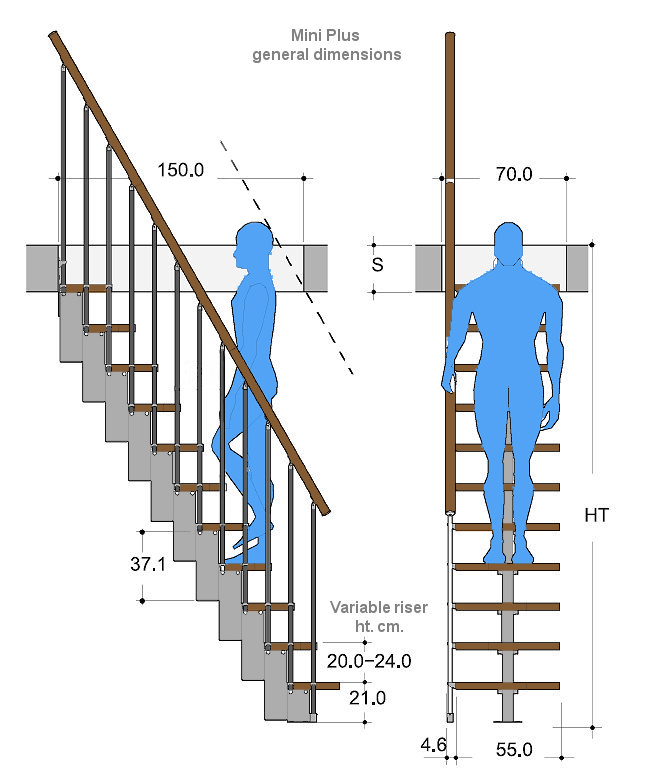 See the diagram above – this full height staircase has total goings of only 1.5 metres, and a width of only 600mm. It is far smaller than a conventional staircase, which would need space of 2420mm L x 800mm W for the same number of treads. The staircase must be built in one or more straight flights, (so if you need a change of direction in the flight you should use a landing to do so, available with some modular systems such as the Gamia Mini Plus). The above is a short description, for a full description of the requirements please refer to K1 building regulations. For more information about Building Regs compliant space saver stairs, please check out the Gamia Mini Plus on our website! 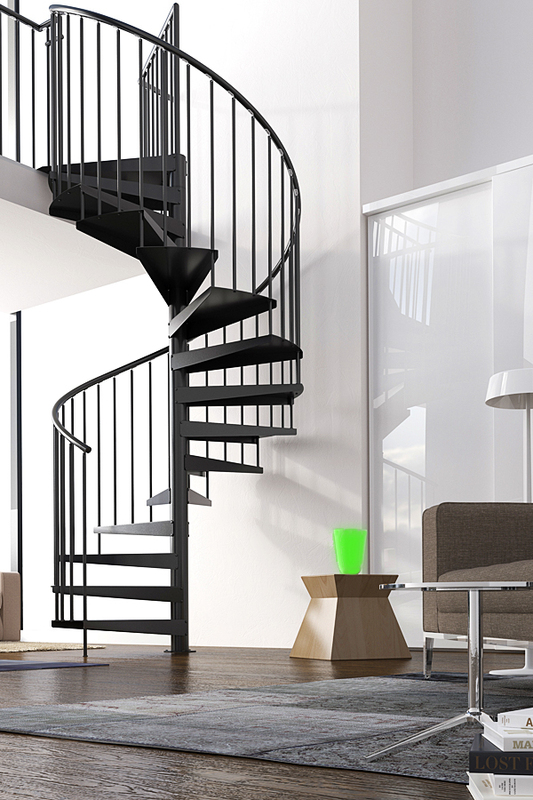 NEW Product – Aria Metal Spiral Staircase. 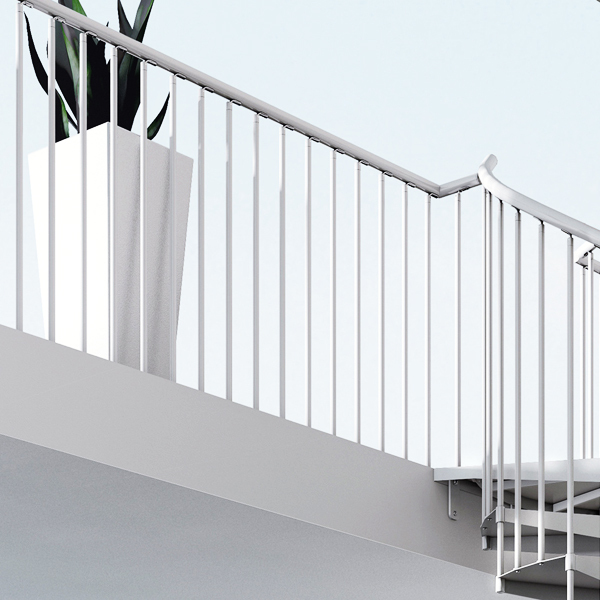 Introducing the NEW Aria Metal spiral staircase kit, in White, Light Grey or Black powder coated finishes. Our latest high-quality product for indoor use, the Aria Metal features colour co-ordinated handrail and spindle fixings for a luxury look, at a very affordable price. 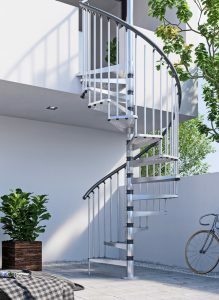 The Aria Metal has another unique feature among spiral staircase kits, which makes this staircase one of the best looking around. For years customers have been asking us to make a spiral staircase with colours that match throughout, and we listened! Competitors usually stick to black handrails, black tread spacers, black plastic fixings etc irrespective of the colour of the staircase. Now if you want an all-white staircase, or all-grey you can have it, as the Aria Metal automatically comes with matching fixtures and fittings. Of course, no spiral staircase kit is complete without the options of landing balustrade to protect the stairwell opening. Whether you are building a square opening, round opening, mezzanine or minstrels gallery, you will find all the components necessary to complete your project on our website. We supply a complete range of balustrade kits and accessories for the Aria Metal, including a FREE design service both for the staircase and the balustrade system. For more information about our terrific new Aria products and lots of other choices please visit our Spiral Stairs Direct online store! 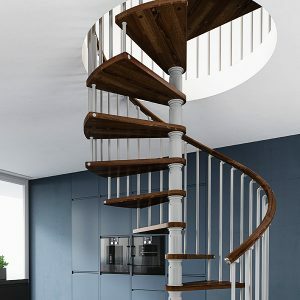 This article covers the various Spiral staircase colour options available, which combinations are the most popular, and which product ranges give you the best choice of colour options. Generally the options for budget spirals like the Calgary are limited to Grey or White metalwork, with light natural coloured treads. The grey finish is a good choice for a neutral colour that will fit into most interior decors, the white finish gives a light bright staircase which is great for a bit of contrast, especially in a modern interior. When you get to the Mid-range spiral stairs you start to see a wider choice of colours. For example in the Gamia Deluxe range a choice of Dark Walnut for the treads and handrail is available, in addition to the Natural Beech colour. Dark Walnut is a rich chocolate brown stain applied to beech treads and then sealed with clear varnish which is baked in an oven to harden it. The result is a hardwearing, fade-resistant satin finish which is robust enough to last many years of regular use. The metalwork can be ordered in silver-grey or black, so there are a potential 4 colour options you can choose from. 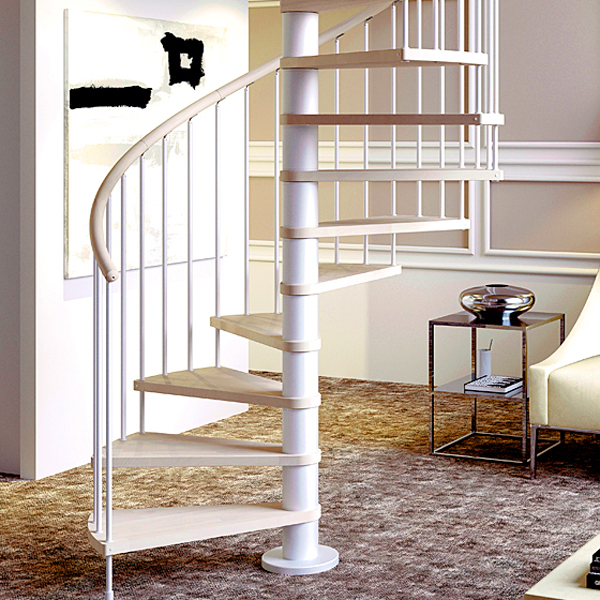 Premium Spiral Staircase kits like the Montreal are also available with real oak treads. With premium spiral staircase kits, the options and choices widen dramatically. 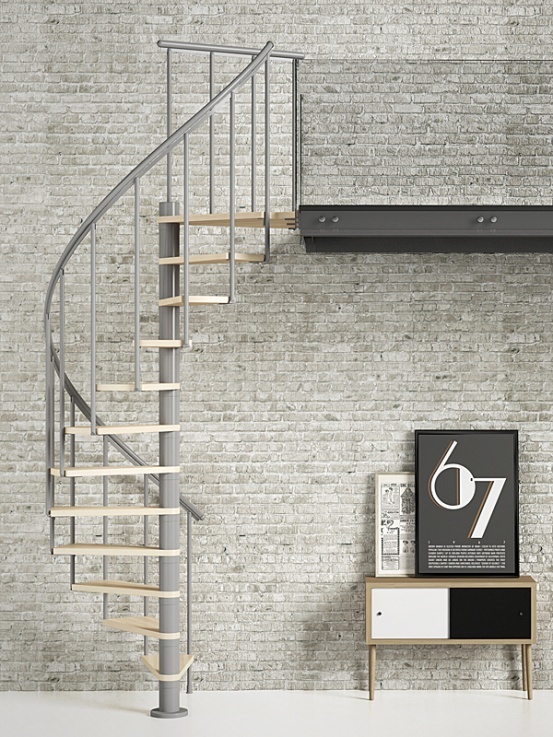 For example, with the Artemis spiral staircase there are 3 standard ranges of metalwork colour – Charcoal Black, Silver Mist and Parchment White. 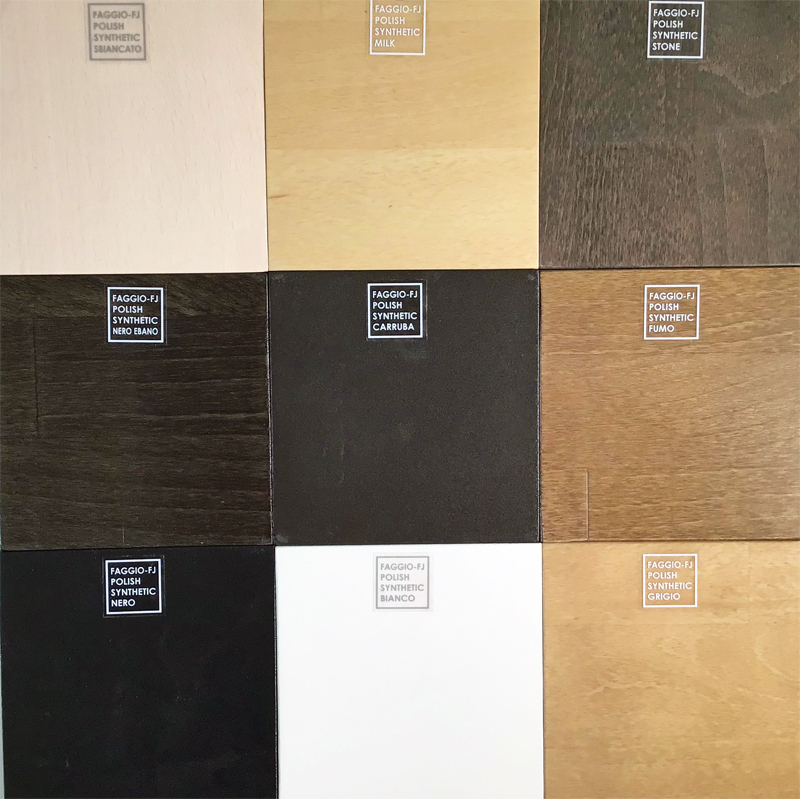 You can match these up with your choice of standard wood stains, Natural Beech, Light Oak, Dark Walnut, and lastly, Wenge. Interestingly, fashion has moved on from the early ‘noughties’ when the most popular finish was Black with natural beech treads. The other colour option fast gaining ground is Wenge – imagine a very dark rich espresso colour, nearly but not quite black. It makes a striking contrast to a lighter coloured metal, we predict a bright (or dark!) future for Wenge as more people get to know about it! 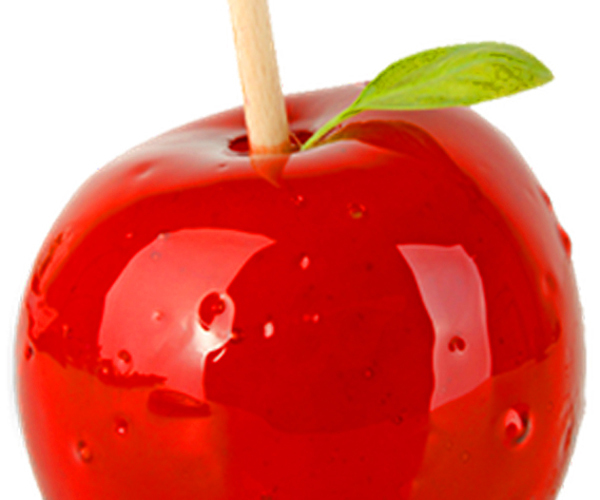 Candy Apple red – let your imagination go wild? 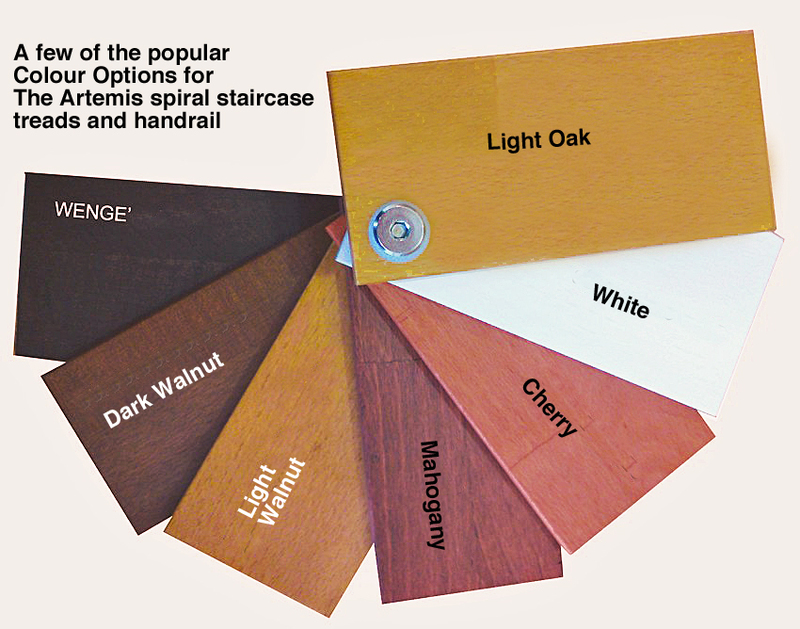 If none of the standard colours satisfy your odd colour cravings, then maybe our custom stairs will help. Yes, we mainly sell custom stairs in the colours already mentioned, usually with a liberal sprinkling of stainless steel and glass, but there is nothing to stop you from having any colour you wish. In fact, we can supply the major components such as treads, balustrade, handrail, metalwork etc without any finish if you want, so you can apply the colours of your choice. Candy Apple Red staircase, anyone? 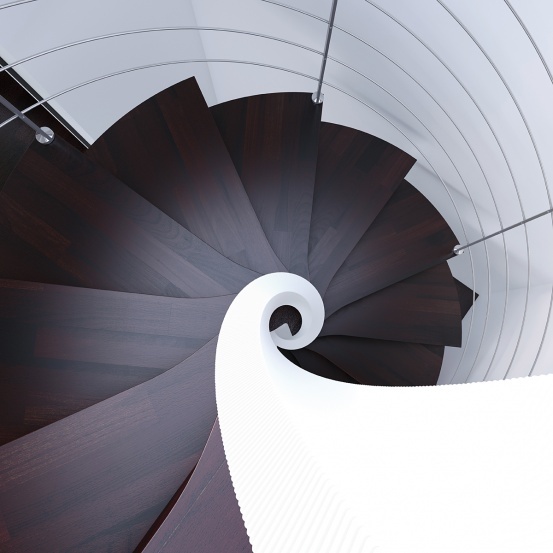 In this article we cover our Top 5 all-time best-selling spiral staircase kits. If you are thinking of buying a DIY spiral staircase kit, check out this post and see why, consistently over the years, our top 5 outsell all the others. We started selling spiral staircase kits online back in 2004, so after 14 years we consider ourselves experts in our field. Read on and see what our other customers have chosen, and why! 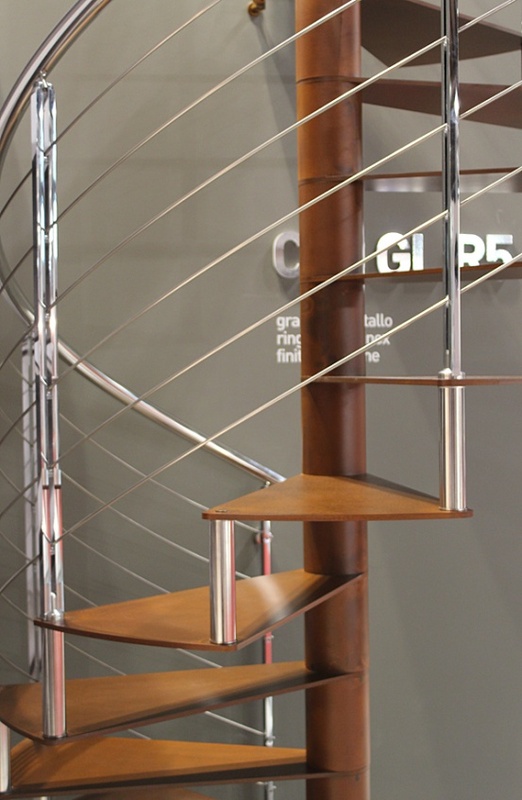 The Gamia Deluxe spiral staircase, our no. 1 best seller for 14 years! Our best seller of all time, a richly deserved accolade for this classic design of spiral staircase kit. The combination of low prices and high specification are what keep this staircase a perennial best-seller. 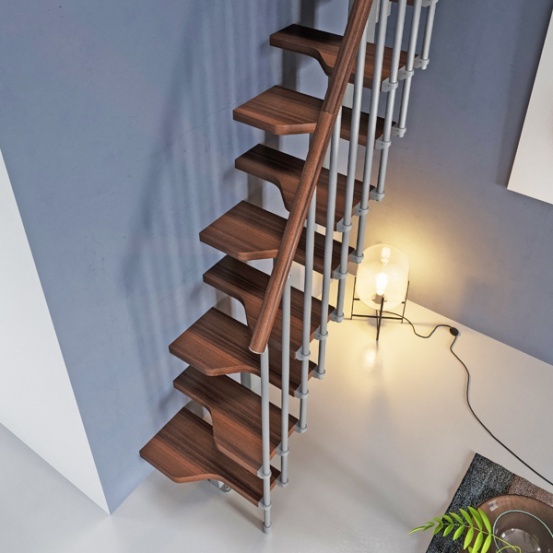 Featuring clean good looks, a solid beech handrail, solid beech treads, and (most importantly) this is the smallest spiral staircase on the UK market that fully meets building regs. 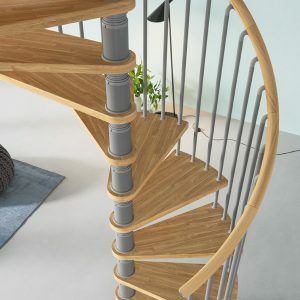 Available in Silver-Grey or Black finish, with natural beech or dark stained beech treads and handrail, you really can’t go wrong with this fabulous spiral. Take a closer look on our website…. 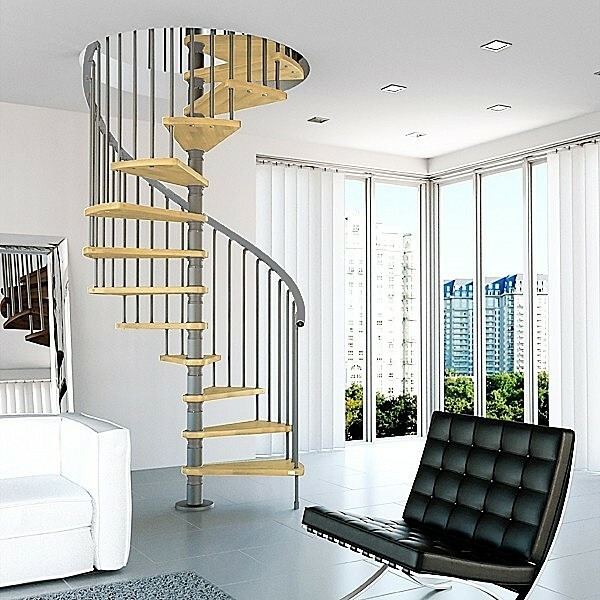 Launched in 2010, The Artemis spiral staircase was an instant hit due to its wide range of finish options, and premium quality fixtures and fittings. This is a really solid staircase, built to withstand heavily trafficked areas. The Artemis has been used in every type of location, from humble loft conversions to car showrooms, as primary staircases in the home, commercial office staircases, house extensions, even Schools! Its no coincidence that, like the Gamia Deluxe, the Artemis spiral staircase features a wooden handrail as standard. We Brits seem to prefer the look and feel of solid wood over plastic handrails, wood adds a touch of class and quality you just don’t get with pvc! Check out the Artemis on our website. 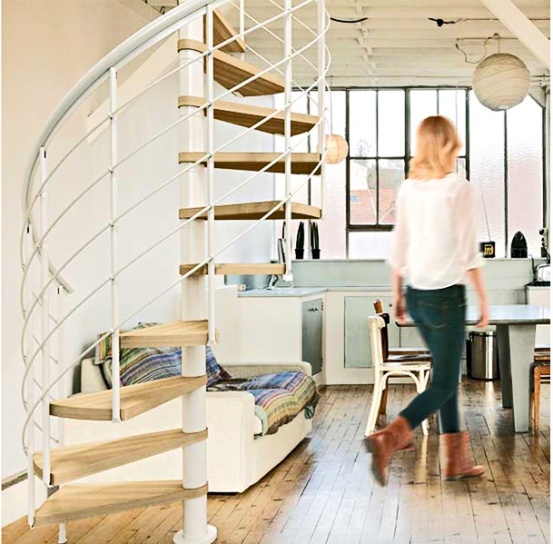 The Montreal Classic 4 spiral staircase is a simple clean Danish design, and the reason it sells so well is the fact that it has Oak treads at a never-before seen price! Well OK, they aren’t solid oak treads, but a form of thick veneer over a multiplex core. However, the real oak finish means the multiplex core is undetectable when the staircase is assembled. So you get the strength benefits of modern laminated construction, and the look of solid oak, without the high costs. If you prefer the look of beech instead of oak treads, that option is available too. Colours are Grey or White, with a Black option arriving around the middle of 2018. BUYERS NOTE: There are different versions of the Montreal, such as the Montreal Classic 3, only the Montreal Classic 4 meets building regs! Check out the Montreal Classic 4 here. Graz semi-spiral space saver staircase. 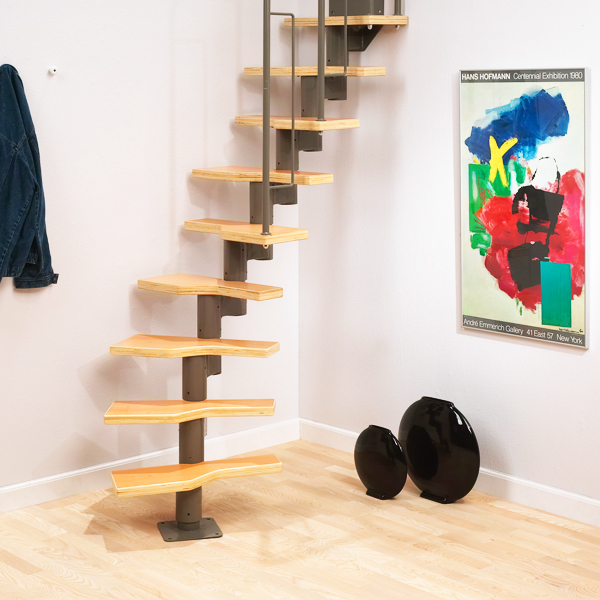 A neat and versatile way to fit a small staircase into your home. The Graz is not strictly speaking a spiral staircase, its a space saver staircase with paddle shaped treads. However, it has a neat trick which allows it to form a curved flight, so you get a semi-spiral shape, with up to 180 degrees of turn! Or you can make it into a straight flight, or have a turn at the bottom, or a turn at the top etc. The choice of layout is yours when you assemble it. Its this flexibility in layout, coupled with a low price, that makes the Graz so popular. One thing to be aware of, the Graz does not meet the exacting requirements of building regulations so won’t suit all projects. For a building regs compliant space saver take a look at the Game Mini Plus instead. Last but not least we have the Gamia Zink exterior spiral staircase. Not only is this a best seller, but we love this staircase for its longevity and durability, especially in our UK climate! The Gamia Zink is hot-dip galvanized, which means the steel components are immersed in molten zinc during production, to form a protective layer against corrosion. 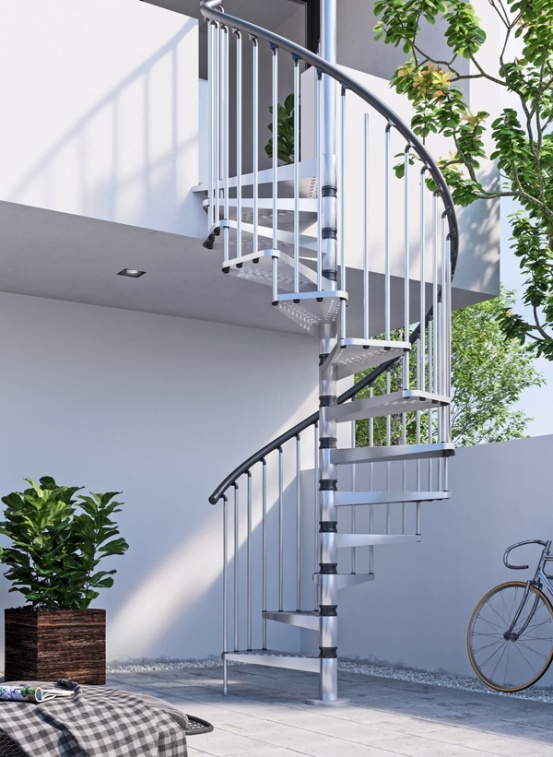 Its a highly effective way of protecting steel against the elements, and make the Gamia Zink a cost-effective way of adding a spiral staircase to the exterior of your property. Our clients have used these spiral stairs for accessing balconies, exterior doors, garage conversions, roof terraces, roof gardens, and in one instance a school used two of them (stacked one on top of the other) to access a tree house! They also get used indoors, to give an industrial look to a modern interior, without breaking the bank. Like the other spiral staircase kits in the Gamia range, the Zink meets building regs and British Standards in the UK. See the webpage for more information……. 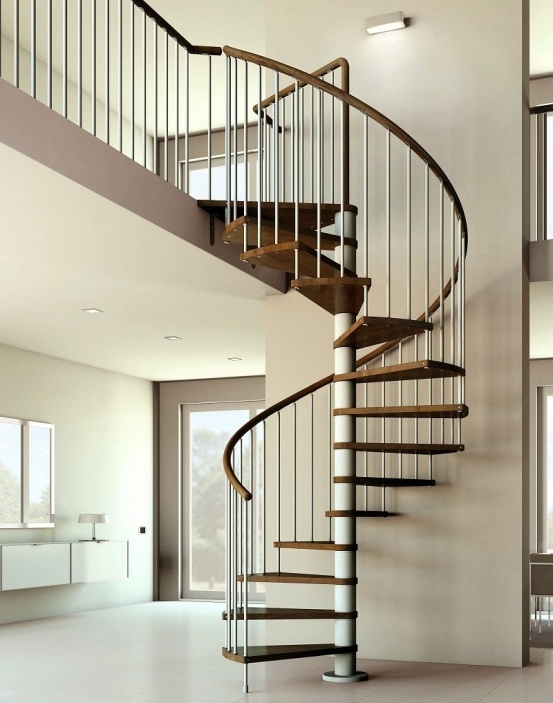 In this article we explore the trend for open plan living, and make some suggestions for using a spiral staircase – so check out our suggestions for one of the larger structures in your living space, the staircase.